Huntington Beach Symphony Orchestra, under the direction of Maestro Grant Sevdayan, continues its 10th Anniversary Season celebration by presenting a double-concert extravaganza, ‘Jewels of 20th Century Music’. 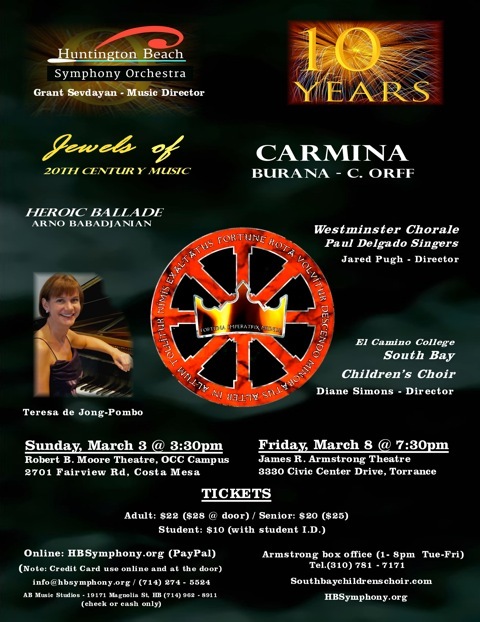 The spectacular Carmina Burana by C. Orff will feature the participation of Westminster Chorale – director Jared Pugh, Paul Delgado Singers – director Paul Delgado, El Camino College based South Bay Children’s Choir- director Diane Simons. The concert will open with charming Heroic Ballade by Arno Babadjanian featuring pianist Teresa de Jong-Pombo.